In a tree, the heartwood is the substance that gives it strength and form; cutting through the bark and sapwood is required to reach this essence. It is at this point that the “story” is revealed. 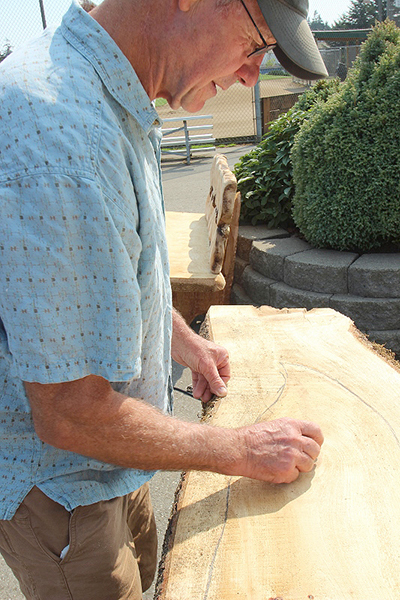 The 12th Annual Woodpalooza—put on by the Whidbey Woodworkers Guild—will open with a reception from 6 to 9 p.m. on Friday Aug. 29 and continue through Monday, Sept. 1. And even though the artisans are busy in their studios, I was able to speak with two of the participants. Both of these woodworkers carve only “salvaged” wood and do not harvest trees for their art work. It was in a pig shed where Jim Short first discovered his affinity for collecting wood. He realized the shed was constructed of black walnut timber and dismantled it to begin his collection. Now, both inside and outside his wood shop are many different kinds of found and salvaged wood he plans to repurpose into something beautiful. 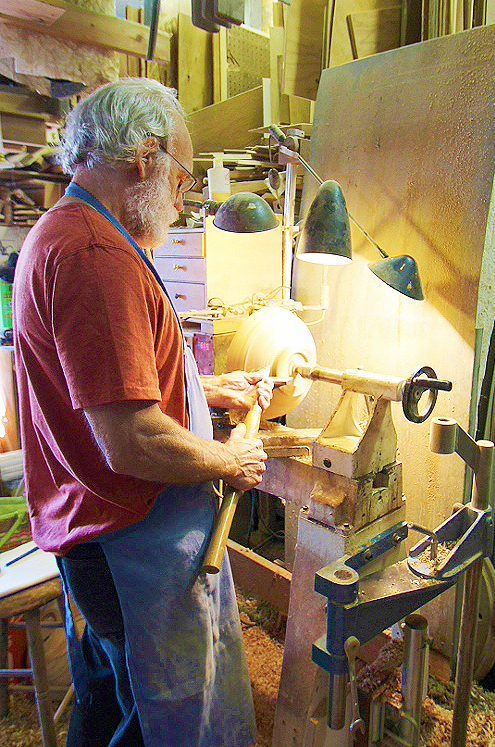 A Coupeville resident, Jim Short is a wood turner. 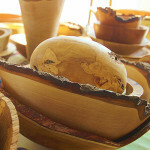 I observed his process and he described the excitement of watching patterns and colors reveal themselves in wood. A turned object is fashioned from wood attached to a spinning lathe; the woodworker uses a gouge to create a form. As the layers of wood are cut away there are rays and waves that could not otherwise be seen. 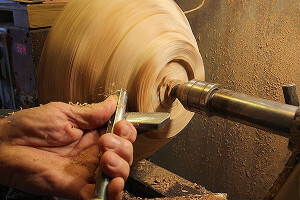 Turning is a multiple-step process that leads to sanding, followed by the application of finishes that enhance and preserve the wood. Short makes bowls, vessels and ornaments in a variety of shapes and sizes. His work is sometimes functional and sometimes purely decorative and sculptural. 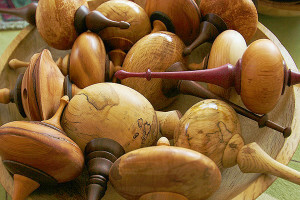 He likes the unusual twists and compressions of the wood—the flaws inherent in nature. Short reads the stories of trees told in the growth rings. He reads about droughts, disease, insects, and the passage of the seasons. The thicker rings in the center, he explained, are young growth that is more vigorous than the growth of a mature tree. Often he can determine, by looking at the rings, a time when tree growth was slowed due to some environmental event. 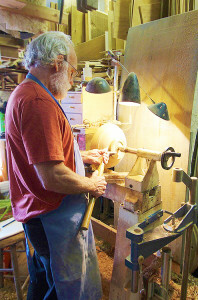 The work of Jim Short can be found at the Penn Cove Gallery in Coupeville. He can be contacted by phone at 360-969-3044 and is available by appointment. Pat McVay, an artist living near Clinton, approaches his work from a different perspective. For McVay, it is less about the material and more about a story he is telling. He has carved stone, sand, snow and ice. “I made the ice sculpture for my own wedding,” he said and laughed as he told how his soon-to-be wife called on the day of the ceremony to make sure everything was going smoothly. She questioned the best man when she thought she heard a chainsaw in the background. Pat said that he finished the ice sculpture, jumped in the shower and made it to the wedding with only minutes to spare—his hair still wet. He carves large wood sculptures using chainsaws, power and hand tools. His work can be found in public installations and private collections all over the west coast and Washington. The “Welcome to Whidbey Island” sign on the way from the Clinton Ferry is his work. McVay has a wry sense of humor and likes to create art that will make people laugh. A great example is his sculpture outside the Clinton Post Office of a man being overcome by junk mail. Pat McVay credits his brother for getting him started in chainsaw carving and there are several other members of his family who have also taken up the art form. Some of their work can be seen in the book “Art of Chainsaw Carving” by Jessie Groeschen. 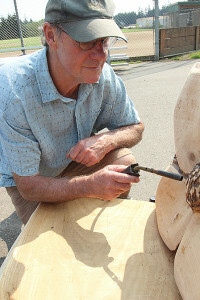 McVay enjoys working with people to create sculpture that is highly personalized. He has done memorial carvings and feels very connected to those honored in this way. His work ranges from playful and whimsical to realistic and inspirational. These two artists, along with sixteen others, will be showing their work and telling their stories at the Whidbey Island Woodworkers Guild’s 12th Annual Woodpalooza. The Guild was formed in 2001 and has allowed the woodworking community on the island to build connections by sharing knowledge and resources. 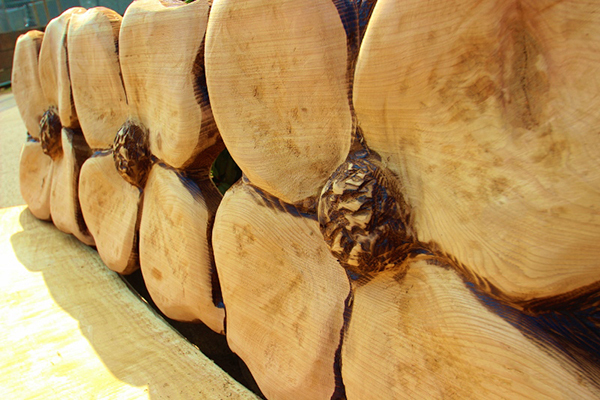 A wide variety of highly skilled wood artisans will present work at this year’s show. 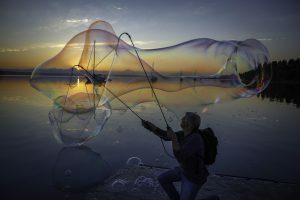 The free exhibition takes place at Whidbey Island Center for the Arts (WICA) in Langley. The show will be open from 12 noon to 5 p.m. daily and run thru Monday, Sept. 1. More information on the show is available at www.woodpalooza.com. To contact Jim Short email morshort@comcast.net. 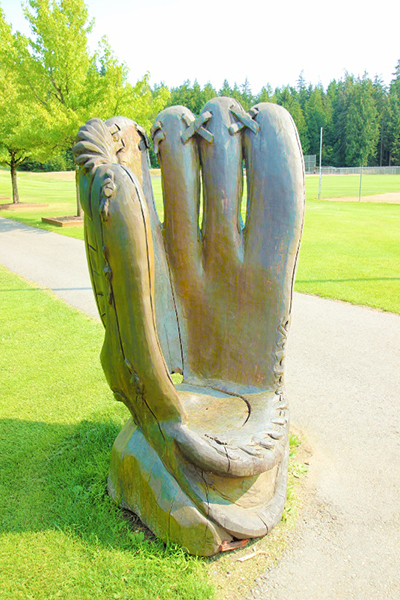 Additional details and contact information for Pat McVay can be found at www.mcvaysculpture.com. See more images from the woodworkers in the August WLM Virtual Gallery show. Martha is a poet, photographer, mixed-media artist, persistent gardener and candle-maker. She has never really gotten over not being photographed for a Richard Brautigan book cover. Currently she is learning to navigate by using her inner compass, which she keeps pointed towards her own true north. Thanks for this article Martha. 🙂 Having had a preview of some of the totally new and one of a kind creations that are about to be unveiled at Woodpalooza at WICA this year— I am truly excited for this grand event…that could perhaps be more aptly titled: WOOD pa WIN ah!! Hope you enjoyed the show Maureen. I know I did. It was great seeing the rest of the artisans and what great work! Another good one, Martha. You’re getting good at this. Lovely photos, too. Why thank-you Russell ! Coming from you I take that as high praise !